President Trump skipped the January opening of the new American embassy in London. In December, the USA’s ambassador to the UK, Robert Johnson — who Trump appointed — said the south-of-the-river site is ‘a great place for us’. Then @realDonaldTrump tweeted the embassy was ‘off-location’. 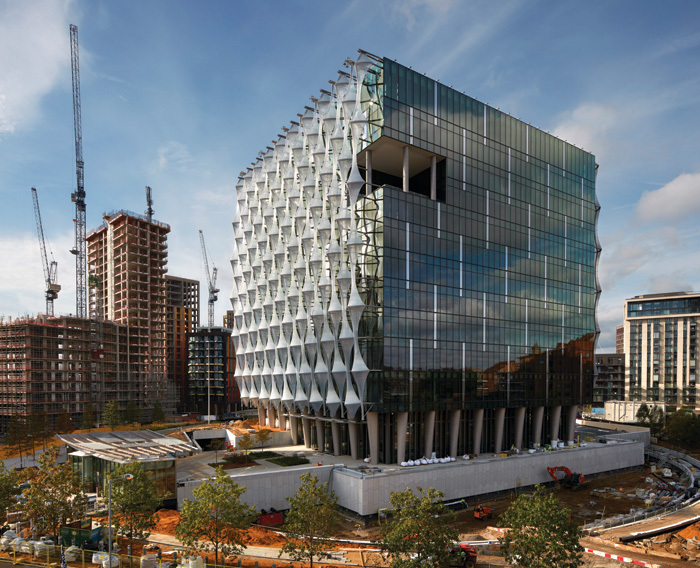 Trump’s tweet put the new embassy — the most expensive ever built — in the headlines, but he was trashing its placement in the Nine Elms area, as well as its staggering $1bn cost, rather than the architecture itself. 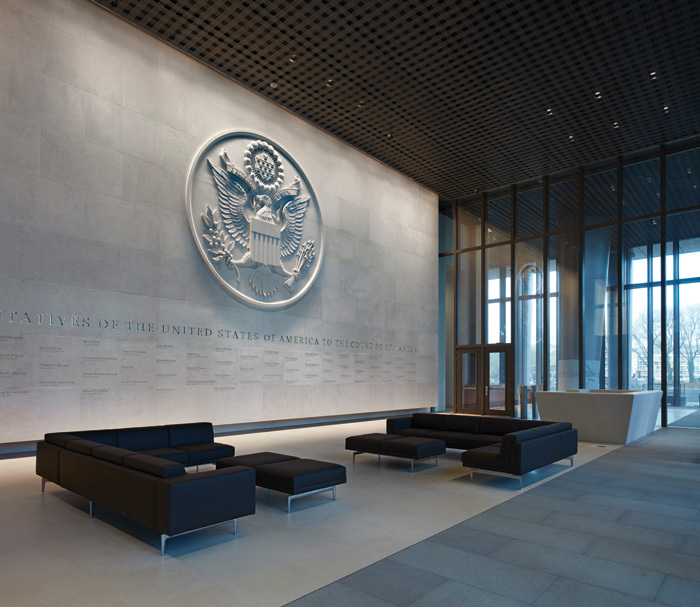 James Timberlake, co-founder of the Philadelphia-based practice KieranTimberlake that undertook the design, proudly stated the embassy is ‘a spectacular building’ and ‘an embodiment of peace and prosperity’. So what’s the real story behind this new glass cube that has landed in south London? London’s previous American Embassy was bound to be a hard act to follow for its successor, wherever it would be. In 1956, Finnish-American architect Eero Saarinen won the design competition for an embassy in Grosvenor Square in opulent Mayfair. This was the time when his bold curved forms were emerging to provide a futuristic counterpoint to rectilinear modernism — his TWA Terminal project at JFK airport in New York ran contemporaneously with the embassy. But in London, the form was modernist. It presented an 85m-wide, rectangular, urbane stone facade detailed with ritzy chrome elements, all floating on columns above a recessed, glazed ground floor which stood on a sloped defensive plinth. The facade was topped with an 11m-wide golden eagle. It opened in 1960 and the scale, materiality and disciplined geometry gave it a glamorous gravitas, like a movie star who knows how to wear jewellery. It certainly looked a lot classier than the austere black US embassy Saarinen delivered a year earlier in Oslo. There are parallels in the story of the new embassy. Following a 2008 decision to move, it too started with an architectural competition, announced during George W Bush’s presidency. Pei Cobb Freed, Richard Meier & Partners and Thom Mayne’s practice Morphosis were the other finalists. In 2010, KieranTimberlake won with a design that, like Saarinen’s had, offered a rectilinear box floating on a glazed ground floor, rising from a defensive base. But everything has got a lot bigger, starting with the base — now it’s a land parcel totalling 2ha. That enables the project to comply with a State Department decree that any new embassy must have a 30.5m secure clearance all around. It’s not exactly wide-open space. 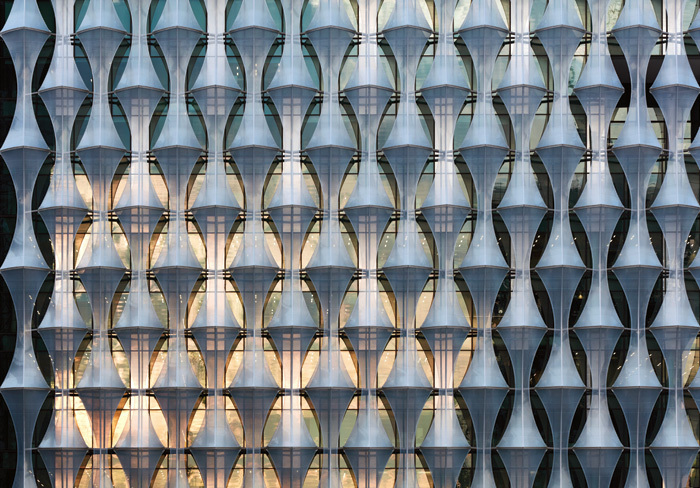 Timberlake described the embassy building as ‘an object within its urban context’, but it’s an isolated object. Admittedly not as wide as Saarinen’s embassy, it nevertheless dwarfs it — this is essentially a 12-storey cube, 65m high; a huge volume that doubles the embassy floor area to 48,128 sq m.
The final parallel is that the facades have something that makes them look unique. Saarinen gilt-edged his stone, but KieranTimberlake hides its glass on three sides with a detached lattice of sails made from the plastic ETFE, stretched between outward-pointed brackets. They counter solar gain — and likely serve to obscure local views in through the otherwise transparent walls, another part of the project’s hypersecurity. Up close, they already look weather-stained, but from afar they create the surrealistic effect of a giant beaded string-doorway screen, or an outpost on a distant planet in a low-budget sci-fi film. The embassy is not the first uncanny-looking box to materialise south of the river round these parts. Brutalist architect Rodney Gordon’s Faraday Memorial in Elephant & Castle’s gyratory system is clad with metallic concave squares, which has puzzled passers-by since 1961. And just downstream from the embassy, for three decades from 1964, there loomed the monumental Nine Elms Cold Store — a solid, slatted, windowless concrete slab that sealed in food and secrets, and which Will Self likened to ‘a great sarcophagus’. Is the embassy’s appearance in the same league of mystery? Strip it of its sails and it looks like just another anodyne glass box that might sit comfortably in an aerotropolis or motorway edgecity. To see what makes the embassy truly different, we need to enter its compound. But first, let’s look at that location that Trump dismissed. Nine Elms stretches from Vauxhall to Battersea Power Station, a sliver between the Thames and a railway viaduct. 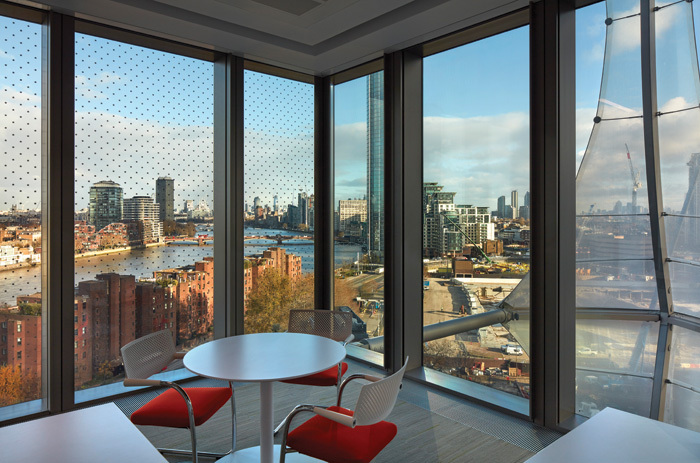 It is an area undergoing London’s latest large-scale regeneration project, with the transformed power station and new embassy acting as the vastly expensive pioneers of neighbourhood change, as the two-stop Northern Line extension to the area won’t open until 2020. From 1974 to 2013, New Covent Garden Market and various logistics companies filled the land. For now, it’s basically a vast field of large residential blocks and the cranes and concrete cores that mark yet more to come. Apart from construction and traffic, the only life adjacent to the embassy at this point is a Waitrose supermarket in one of the massy Feilden Clegg Bradley Studios-designed brick volumes of residential project Embassy Gardens. However, the embassy’s northern face, the only one not covered with EFTE sails, looks across the Nine Elms Road to the river, less than 100m away. An open riverside gap called Bourne Valley Wharf is where a curling-path foot-and-bike bridge designed by Danish practice Bystrup was to land, but that may be relocated to appease Westminster Council on the other side. Thames Water is constructing a small raised-garden structure from industrial-era cast-iron panels on the Riverside Walk here. A linear park will thread its way between residential blocks, the full length of Nine Elms, and the embassy lies in its path. KieranTimberlake and its landscape consultant, fellow Philadelphian firm OLIN, bridge that gap around the big box. Along the compound’s Nine Elms Road edge it has created a public park, but the embassy building is sealed from it by a body of water. It’s not quite a moat because it doesn’t fully surround the embassy — the Americans refer to it as ‘the pond’, with its obvious allusions to the ocean between the UK and USA — but it sure is reminiscent of one. Three curving perimeter pavilions screen the embassy on the other sides, and they are the gateways into the secure compound. The flagpole is located within the compound to the south east, so that Marines don’t need to step into public realm to raise the flag. Each pavilion is a one-storey glass volume. To the west is the biggest, for services. Most of the expected 1,000 daily visitors come for visas, and they enter through the wide South Pavilion, while official visitors come through the East Pavilion. These two pavilions are all about airport-style security checks, and their interiors are simple and functional. Between the East Pavilion and the embassy box, things get interesting. A tranquil plaza is planted with rectangular hedges and lonely trees. The pond lies below the northern edge, stretching alongside the embassy block, then beside a lawn for receptions on the west side. Grey Cornish granite walls rise from the water, on which American artist Jenny Holzer will inscribe messages. Two waterfalls animate the silent monumentality of granite and the great cube above it. 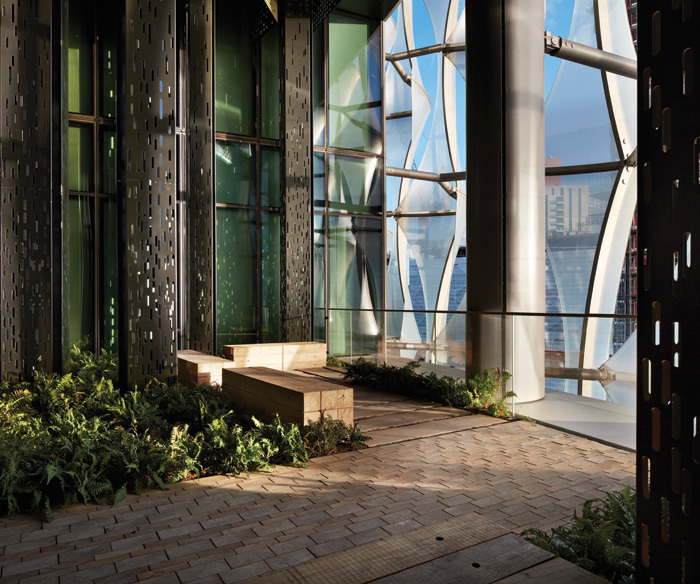 The embassy is raised over a double-height ground floor by metal piloti, nine on each side, which widen with height and are sadly too close to the glass to create walkable colonnades. Inside, the ground-floor perimeter spaces are airy and subdued. 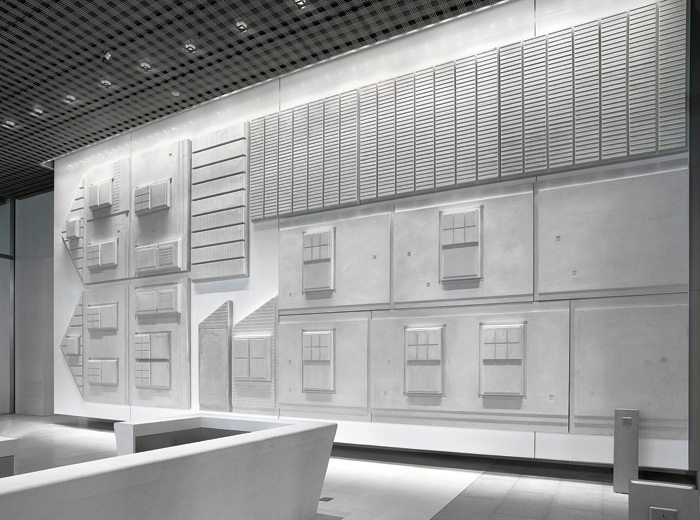 A characteristically monochrome Rachel Whiteread sculptural relief, titled US Embassy (Flat pack house; 2013-15), stretches across the wall of the consular reception. In the main lobby, a vast mural of 32 panels by American artist Mark Bradford, known for embedding written messages in his canvases that feel like street art, depicts the full text of the American constitution. The 4.5m-high storeys above have column-free floors, and the floor plates, which carry chilled beams and underfloor ventilation, reach 15m from core to perimeter. Because the staff number of around 800 hasn’t changed since the move, there’s a greater feeling of space (some randomly sampled workers report that they find the extra space refreshing). Ambassador Johnson comments that ‘people can collaborate more’ in the new office environment. On the first floor, the public visa services room is designed to reduce stress. Everything feels creamy in the subdued light. 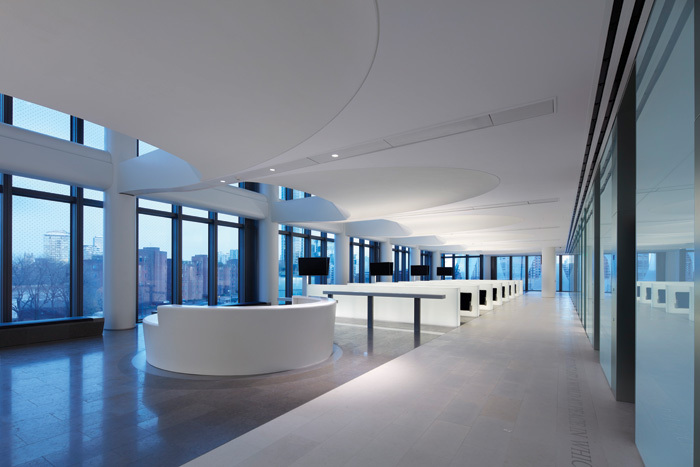 The ceiling is carved into gentle arcs and curves indent it from the windows. There are cinema-style seats and the interview booths are open to the long open-plan space. But elsewhere, light is brighter and the use of white everywhere can feel as if a dental hygienist had been put in charge of the colour palette. The super-clean aesthetic used across the building makes many corridors and conference rooms feel sterile. By contrast, the simple wood decor in the staff bar, called The Pub, which occupies a corner with a view, is all painted black, except the dartboard. But there’s also some skilful play with internal spaces. For example, the fifth-floor cafe, served by a long, open, food bar and overlooking the river, extends to a double-storey break-out area, and the mood feels as free as the dozens of decorative coloured shapes hanging from the ceiling. Look closer, and the rigorous patriotism permeates this too: each shape bears the Great Seal of the United States, while the river-facing windows are covered with equally spaced stars reminiscent of the American flag (which also function to prevent bird impacts with the glass). Elsewhere, other stairways are open and also encourage interaction. Best of all are the six internal gardens, which OLIN also worked on. These reference different American landscapes. On the third floor, the Pacific Forest garden is open to the outside on a double-height terrace, with redwood decking and ferns growing in soil beds. Perforated steel columns rising through it are a metaphor for sequoia trees. On the fourth floor, the Canyon Lands garden is far drier. Tables and chairs sit beside a jagged-edged enclosure of sand, in which grow the sort of cacti and palms you’d find in Arizona and Nevada. Both these garden arrangements may feel contrived, but they’re alive. Up on the ninth floor, the Ambassador’s Garden is a two-storey private space that cuts into a corner of the embassy volume, the only disruption to its form clearly visible from outside James Timberlake offered that ‘the brief called for a design which was iconic and symbolic of the “special relationship”’ — the one between the USA and UK. Well, the relationship is certainly big, just like the building, but is the design saying that it’s also boxy and somewhat obscured by a flimsy veil? 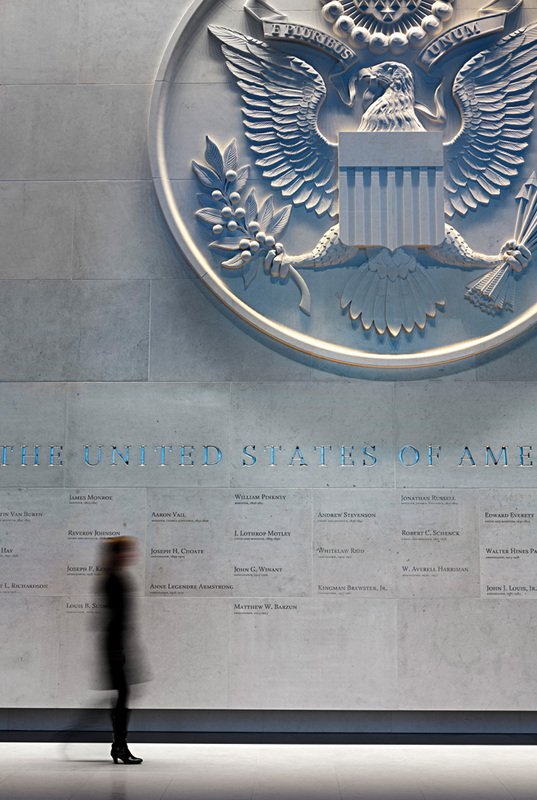 This embassy may not be to everyone’s taste — but nor was Saarinen’s when it opened. There’s plenty to like about it, such as the art and the park, and not least its sustainability. It claims net carbon neutrality, and its wastewater reclamation system, solar photovoltaic array, ground source heat pump and the stormwater control capacity of the pond are among features which are expected to earn it LEED Platinum and BREEAM Outstanding ratings. Clearly, the ethical long-term investment in sustainability has a shorter-term price, and it will have contributed to the $1.2bn that Trump mentioned in his bombshell tweet. What he didn’t mention is that the sale of the Saarinen embassy and other American diplomatic properties in London financed it, not the American taxpayer.